Kick off summer at the 36th California Strawberry Festival. Indulge in chocolate dipped strawberries, strawberry margaritas, strawberry pizza and dozens of other strawberry treats at the two-day festival, Saturday and Sunday, May 18 and 19 at Strawberry Meadows/College Park in Oxnard (3250 South Rose Ave.). Hours are 10:00 a.m. to 6:30 p.m., both days. Festivalgoers can sample strawberry-themed food and drink from over 50 vendors and take part in strawberry pie eating contests, strawberry relays, strawberry tart tosses and other free contests. 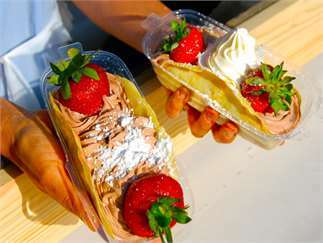 An estimated 1.5 million strawberries will be consumed at the festival. The two days also feature a vendor marketplace, live music on three outdoor stages, cooking demonstrations and contests (with fresh strawberries of course) and kids' rides and entertainment at their own Strawberryland. Since its inception, the California Strawberry Festival has donated over $4.5 million to southern California charitable organizations. A free shuttle service to the festival is available ($10 to park onsite). Admission: adults, $12, seniors (62+), $8, kids (5 to 12), $5, ages 4 and under, free. More information: www.CAStrawberryFestival.org, 888-288-9242, csf@CAStrawberryFestival.org. Cost: Admission: adults, $12, seniors (62+), $8, kids (5 to 12), $5, ages 4 and under, free.